Teeth help us chew better and smile beautifully, and a few of them missing can make a great difference to our self-image and health. Dental implants step in to, quite literally, fill this gap. They have significant advantages over conventional removable dentures but the high cost sometimes keeps patients from availing them. Dental implants in Costa Rica, Mexico, India, El Salvador, Thailand, and Jordan are available at significantly lower prices than in the US and Canada. This article is not only about the cost of dental implants overseas, but also about the types of implants available today, the procedure, care to be taken before and after the procedure, and more. Did you know: Dental implants can’t get cavities! Though they don’t decay like natural teeth, they still need to be cleaned and properly taken care of! For Canadians and Americans, a full set of dental implants in Mexico is easily affordable and do not compromise on quality. Certain requirements for receiving dental implants are general good health, commitment to a healthy lifestyle and healthy gums, and adequate bone to support implants. (i) Bone grafting.This means taking bone from one part of the body to the place in the mouth where the implant will be fixed. This is done to enlarge the bone structure. Bone can also be moved from one place in the mouth to another. If, for some reason, bone grafting cannot be done with the patient’s bone, then either artificial bone or a graft from a donor or an animal is taken. Grafting is done four to eight months before the implant procedure to allow the graft a chance to heal before it is disturbed with the implant process. (ii) Subperiosteal implants. These implants are not placed in the bone. A CT scan is commonly used to obtain a model of the bone structure and then the implant fixture is molded to precisely fit the bone model. Eat a meal before going to the dental clinic. Prepare small bags of ice to be used after the dental implant surgery. Do not take aspirin or any product containing aspirin 7 days prior to surgery. Do not drink alcoholic beverages for 3 days prior to surgery. Did you know: The rate of success of dental implants has been reported to be 98%! Under local anesthesia, the tooth root implant, which is a small post made of titanium, is placed into the bone socket of the missing tooth. As the jawbone heals, it grows around the implanted metal post, anchoring it securely in the jaw. The healing process can take up to 3 months if it is the lower jaw and 6 months if it is the upper jaw. After it is healed, a second surgical procedure is required to uncover the implant, remove the cover screw, and place an abutment or a temporary crown in the implant. Temporary crowns are generally used for aesthetic reasons, when the implant is in a visible place. An additional two months is required for the soft tissue to heal enough to receive the final prosthetic tooth. Molds are used to make custom abutments. The prosthetic tooth is sometimes attached to a gold cylinder that can be screwed into the abutment or it can be directly cemented onto the abutment. Drink ice water for the first 24 hours. Do not drink hot liquids for 24 hours following surgery. Eat soft, easy-to-chew food for a week (avoid chewing near the surgical area). Use a new toothbrush after surgery. Do not use toothpaste until sutures are removed. Rinse with water after each meal to cleanse the surgical wound. Try not to use the side of your mouth with the temporary crown. Shift the bulk of your chewing to the other side of your mouth. Do not eat hard foods like carrots, apples, etc. which could dislodge or break the crown. Oral hygiene and periodic dental visits are very important for the long-term success of dental implants. How Much is the Cost of Dental Implants Abroad? The average price of a single dental implant begins from $750 in Mexico. In Thailand, the average dental implant cost in Costa Rica is about $650, as of October 2017. A single tooth implant in Thailand costs 60,000-65,000 Thai Baht. In the United States, the average prices range between $1,000 and $4,000. If it is the cost of dental implants in the US that’s worrying you, relax. Cheap dental implants abroad in Mexico, Costa Rica, Thailand, and India are available at a fraction of the prices in the US. And the dental clinics in these countries not only offer low cost, but also high quality dental work. They are also equipped with the latest technology. The dental implant process followed in our network of dental clinics is exactly the same as that in the US clinics. How Much are Implants in Mexico? The cost of a tooth implant in Mexico begins from $750. Get access to attractive dental packages. Contact us now for a FREE Quote! The dental implant surgeons in Mexico, Costa Rica, El Salvador, and India are well qualified and highly experienced. They speak very good English. Hence, there will be no communication problem. The confidence and feel-good factor that come with dental implants outweigh any concerns about the cost of dental implants. Even that cost will be taken care of, if you choose to have dental implants done abroad. Further, if you choose a logistically-viable destination for your dental work, you can even curtail your travel costs and time. Arizonians and Californians, for example, can get dental implants in Los Algodones, Mexico (a tiny border town located about 10 miles from Yuma, Az). The best foreign country for dental implants for people from Nigeria, Kenya and other parts of Africa, West Asia, the UK and other European countries is India. People from these parts of the world can rein time and airfare by electing to get dental implants in Delhi and other major cities in India. Thailand is a viable dental tourism destination for Australians. The average cost of dental implants will drop drastically if you elect to have them done in a dental tourism destination. Contact us now to know your options and book an appointment! The cost of dentures will vary between $500 to $2,500 per upper or lower arch. And the cosmetic dentist’s fees are usually $300 to $1,200 per arch. Dentures made by traditional means typically cost from $800 – $1,500 per plate (upper denture or lower denture). Neuro-muscularly fitted dentures are more expensive, often $5,000 to $7,500 for a full set. The average cost of a dental implant begins from $650. The price can increase significantly if additional procedures are needed like bone graft. But when it comes to your health, cost cannot always be the sole deciding factor. And a quick comparative analysis of dental implants vs. dentures should help you know that the latter will never feel or look like your own teeth — they may click and move — unlike dental implants. And if they move, your speech may become slurred. Because dental implants are designed to fuse with bone, they become permanent. Also, the average cost of dental implants will drop drastically if you elect to have it done abroad. Broken or missing teeth may make you feel embarrassed when appearing in public. You may feel uncomfortable talking to strangers or, even worse, you might begin to avoid smiling. Also, because of the missing teeth, you may not be able to chew your food properly or have to avoid certain food. All these inconveniences can be avoided by the use of dental implants, which will lead to improved appearance, comfort, and self-esteem. Today, most dental implants are made of titanium, a metal with special qualities that make it useful for this purpose. The most important reason why titanium is used for dental implants is that the body does not reject it as a foreign object. Hence, osseointegration happens efficiently. Titanium develops a thin film on its surface that protects it from corrosion. It is resistant to acids, salt solutions and oxygen, among other things. Titanium is also almost completely nonmagnetic and is extremely strong for its weight. There are two common types of implant used today. Your oral surgeon decides which type of implant to use based on the quality of the bone in your jaw and the type of crown, bridge or denture that will be placed on the implant. Endosteal (in the bone): This is the most commonly used. The various types include screws, cylinders or blades surgically placed into the jawbone. 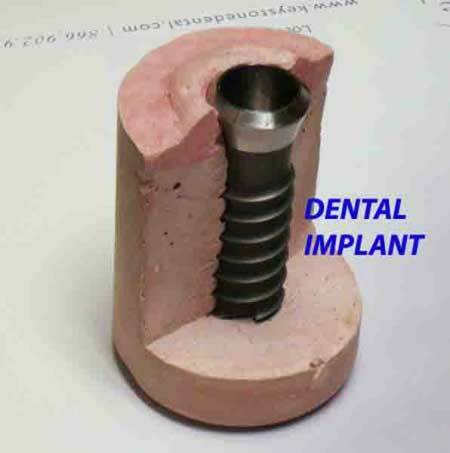 This type of implant is generally used as an alternative for patients with bridges or removable dentures. Subperiosteal (on the bone): These are placed on top of the jaw, with the metal framework’s posts protruding through the gum to hold the prosthesis. Subperiosteal implants are indicated for patients who cannot wear dentures and who have less bone height. With bone grafting, the success rate will be slightly lower, and with smokers may dip to 50-60%. (Smokers do not heal normally due to impaired small capillary circulation; many surgeons will not perform dental implant procedures on a smoker). There’s a 5% difference in implant success rate between diabetics and non-diabetics. The better your diabetic control, the higher the implant success rate. If it is the cost of dental implants in the US that’s worrying you, then relax! 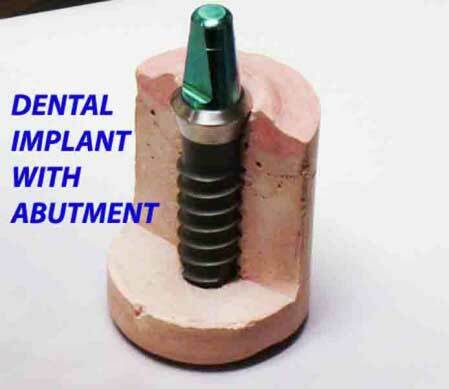 Cheap, yet quality dental implants are available overseas. Get Free Pricing Now! 1. A titanium post is inserted, on which a temporary tooth/crown is placed. Usually the process takes about 15 to 20 minutes. 2. Osseo integration is quick and in 30 days you have your permanent crown in place. 3. The Immediate Load Dental implant can be set at an angle, if need be, and removes the need for bone grafting. It is obvious that when compared to traditional implants, same day dental implants save the patient a lot of time and inconvenience. However, it is best to consult your dentist on what’s the best for you. The main disadvantages of dental implants are the time and cost involved. Also, some people may need to replace the crown in 10-15 years. The first two disadvantages can be easily overcome. The cost of dental implants overseas in countries like Mexico, Costa Rica, El Salvador, and India is at least 50-60% lesser than that in the US or Canada. With advancement in technology, you no longer have to wait months together for the implant process to finish. Same day dental implants or immediate load dental implants are available now and, in a couple of visits, your implant is ready. Not everyone qualifies for same day implants though. After evaluating the individual’s medical conditions and jaw bone structure, a prosthodontic can know if immediate load dental implant is a viable option. The best foreign countries for dental implants are Mexico, Costa Rica, Thailand, and India. They offer the right combination of affordability and quality care. Reviews for dental implants in Mexico, Thailand, India and Costa Rica are also available on the website. These countries offer the right combination of affordability and quality care. Medical Tourism Corporation facilitates affordable dental implants at many international locations including Mexico, India, Thailand, and Costa Rica. Contact us for Free Pricing.